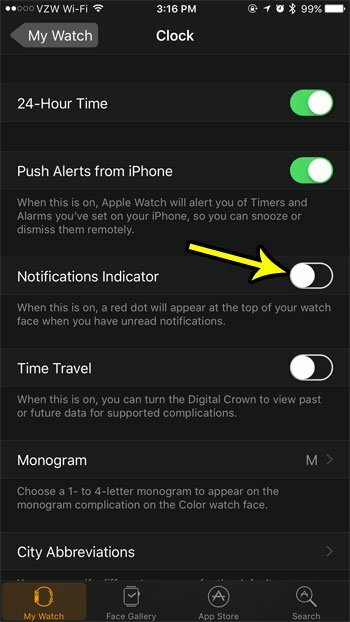 It’s easy to check notifications on your Apple Watch by simply glancing at your wrist when you hear or feel an alert. Unfortunately you might get a lot of alerts at once, or you may be doing something where you are unable to check those notifications as you receive them. If you have unread notifications on your watch, then a red dot will appear at the top of the watch face to let you know. But if you don’t like or don’t need that notification indicator, then you may be looking for a way to turn it off. 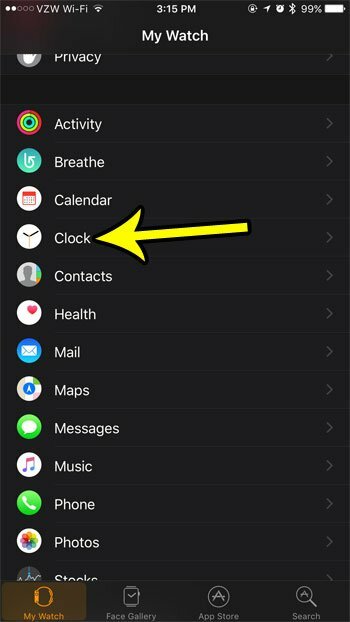 Our guide below will show you where to find the setting that controls the display of the Apple Watch’s notification indicator. The steps in this article were performed on an iPhone 7 Plus in iOS 10.3.3. The Watch being affected by this change is an Apple Watch 2 using the 3.2.3 version of WatchOS. Note that this is not going to stop you from receiving notifications on your Apple Watch. It is only going to remove the red notification indicator that appears at the top of the watch face. Step 2: Choose the My Watch tab at the bottom-left corner of the screen. Step 3: Scroll down and select the Clock option. Step 4: Tap the button to the right of Notifications Indicator to turn it off. The red dot on your watch face should go away almost instantly after you make this change. You can still access your notifications by swiping down from the top of the watch face. Do you dislike how easy it is form someone nearby to read any of the notifications that you receive on your Apple Watch? Enable notification privacy on the watch so that you can only read the details of a notification when you want to, without anyone next to you immediately seeing them when you receive an alert on your watch. How Do You Fill a Cell With Color in Excel 2013?